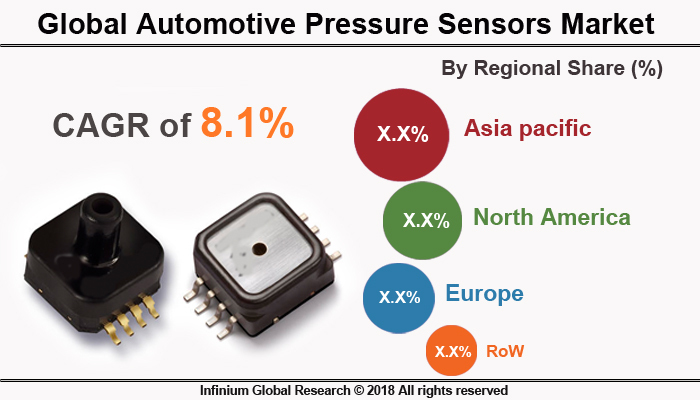 A recent report published by Infinium Global Research on automotive pressure sensors market provides in depth analysis of segments and sub-segments in the global as well as the regional automotive pressure sensors market. The study also highlights the impact of drivers, restraints and macro indicators on the global and regional automotive pressure sensors market over the short term as well as long term. The report is a comprehensive presentation of trends, forecast and dollar values of the global automotive pressure sensors market. According to the report the global automotive pressure sensors market is projected to grow at a CAGR of 8.1% over the forecast period of 2018-2024. Pressure sensors are the key components in reducing emissions and fuel consumption to decrease air pollution. Automotive Pressure sensors can vary drastically in technology, design, performance, application suitability, and cost. Rising environmental and safety concerns due to the increasing vehicle numbers are forcing governments to enforce stringent vehicle emission and safety norms in the developed regions. This has resulted in an increased number of automobiles equipped with various safety systems such as EGR(Exhaust gas recirculation), ABS, and airbags, which require pressure sensors for functioning that eventually drives the growth of the Automotive pressure sensors market. In addition, Growing popularity of micro-electromechanical system and nano-electromechanical systems are anticipated to strengthen the growth prospects of the automotive pressure sensor market. However, a complex manufacturing process and high cycle time are curtaining the demand for automotive pressure sensor market. The technological advancement in several industries such as automotive, healthcare, and oil and gas, the applications and functionalities of pressure sensors are evolving continuously. Therefore, the demand for piezoresistive pressure sensors and engine optimization is attributed to have a wide range of applications in the automotive sector. The emergence of fusion box technology is providing several growth opportunities for the key players in the automotive pressure sensor market. The Asia Pacific prevailed the automotive pressure sensor market and it is expected to continue its dominance over the upcoming years. Moreover, rapid level of industrialization in Asia Pacific region is contributing to the growth for automotive pressure sensor market. The boosting market in China is driving the market for automotive pressure sensors. The Asia Pacific followed by North America and Europe accounted for more than half of the global market revenue share. The existing vehicles in North America are equipped with advanced safety features and body electronics that serve the majority of the market. The report on global automotive pressure sensors market covers segments such as application and vehicle type. On the basis of application, the global automotive pressure sensors market is categorized into tire pressure monitoring systems, brake booster systems, exhaust gas recirculation systems, engine management systems, airbag systems, and vehicle dynamic control. Based on vehicle type the global automotive pressure sensors market is categorized into the passenger car and commercial vehicles. The report provides profiles of the companies in the global automotive pressure sensors market such as Robert Bosch, Denso, Delphi, Infineon technologies, Sensata Technologies, Continental AG, Texas Instruments, Melexis, Analog Devices and NXP Semiconductors. The report provides deep insights into demand forecasts, market trends, and micro and macro indicators. In addition, this report provides insights into the factors that are driving and restraining the global automotive pressure sensors market. Moreover, IGR-Growth Matrix analysis given in the report brings an insight into the investment areas that existing or new market players can consider. The report provides insights into the market using analytical tools such as Porter's five forces analysis and DRO analysis of automotive pressure sensors market. Moreover, the study highlights current market trends and provides forecast from 2018-2024. We also have highlighted future trends in the automotive pressure sensors market that will impact the demand during the forecast period. Moreover, the competitive analysis given in each regional market brings an insight into the market share of the leading players. This report will help manufacturers, suppliers, and distributors of the automotive pressure sensors market to understand the present and future trends in this market and formulate their strategies accordingly.